COLLEGEDALE, Tenn. — Margaret Randolph, named Tennessee Music Teachers Association “Teacher of the Year,” brought her award-winning music to residents at The Lantern at Morning Pointe Alzheimer’s Center of Excellence, Collegedale. She and students from her private studio performed chamber and Christmas songs with piano duets and vocal solos, filling the halls with beautiful harmonies at the Alzheimer’s memory care community. Morning Pointe invites musicians and performers from all genres to share their talents with the seniors. 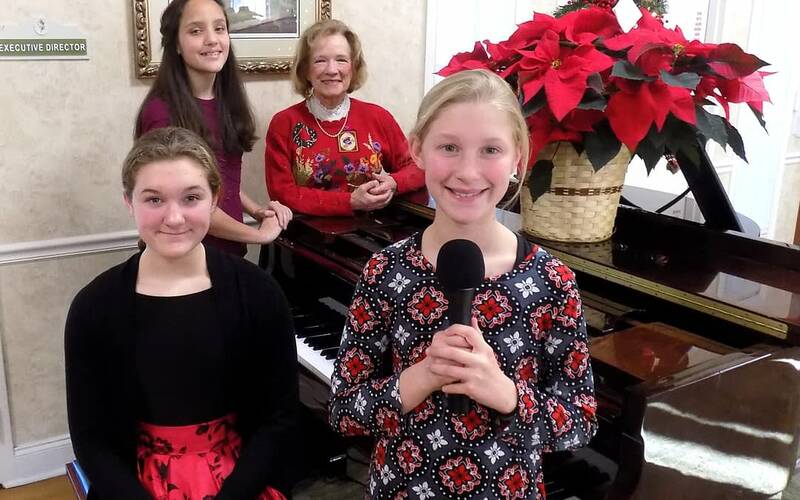 Photo: Margaret Randolph, music teacher, and Emma Moore, Ella Lipscomb and Eva Lipscomb, music students, perform Christmas favorites for residents at The Lantern at Morning Pointe Alzheimer’s Center of Excellence, Collegedale.